Space is not empty: thin interstellar gas and dust fills the vacuum between stars, and each star radiates a solar wind of ionised particles through its solar system. But this is not thick enough to conduct sound, shockwaves or lightning, even if Space: 1999 occasionally showed otherwise. Lightning is seen in Breakaway, briefly in Matter Of Life And Death, and The A B Chrysalis, while shockwaves were supposed to occur in The A B Chrysalis, Collision Course and Space Brain. A debris shockwave can be created, but none of these instances involve creating lots of debris. In Another Time, Another Place and other episodes in which shockwaves are seen or referred to, they are evidently transmitted through the lunar crust, which is scientifically correct. In Bringers Of Wonder one scene shows fire burning in vacuum, which is impossible. In Ring Around The Moon Koenig orders "Try to make contact with them. Use sound, light, radio wave patterns, the entire frequency scale." Of course, sound is not on the electromagnetic spectrum and cannot travel through space. In The Last Enemy Koenig claims interference is "probably some kind of ultrasonic magnetic distortion": again, ultrasonics (sound beyond the range of hearing) have nothing to do with magnetism and could not occur through space. In Black Sun Koenig asks for "sonar readings": sonar is an acronym for sound navigation and ranging, a technique measuring ultrasonic echoes to determine the landscape under the sea. In addition to these admittedly minor slips of the tongue, most episodes showed Eagles and spaceships moving through space accompanied by the hum of their engines, and for every explosion we heard the boom. These sounds, however, are really a dramatic device rather than careless or ignorant science. Nebulae are clouds of gas and dust in space, often tens of light years wide. They are sometimes luminous as young stars inside the cloud ionise the cloud atoms, or as they reflect light from stars outside the cloud. Perhaps by colliding with another cloud, or being swept into the spiral arm of a galaxy, or if a nearby star explodes, the cloud may collapse, breaking into fragments which in turn condense into stars. Although composed largely of hydrogen, surprisingly complex carbon compounds have been discovered in the clouds adhering to dust and ice particles, and controversial theories have proposed viruses may exist in nebulae. The proponent of this theory, Fred Hoyle, also imagined a living cloud for his science fiction novel The Black Cloud , with highly complex magnetic fields creating and insulating a neurological structure and propelling it between stars where it feeds on solar energy. Space Brain depicts such an intelligent cloud. Though the link to the many dependent worlds and life forms is mystical, the cloud and its organic antibodies are logically devised. The Beta Cloud reveals a more malevolent but obviously not very intelligent nebulae. It is not explained how a gaseous cloud constructs the mechanics and electronics of a robot, or why it wants the Alphan life support system. The cloud in The Lambda Factor is an ionised nebulae (or "filled with electrically charged particles", as they put it), apparently radiating radio waves with the lambda variant wave pattern. The cloud and firestorm in Catacombs Of The Moon may be a protostar collapsing out of a nebulae. Such a protostar would be perhaps a hundred times the diameter of the sun and radiating infra red radiation as the contractional energy slowly heats the core over 20-30 million years, until it is hot enough to ignite nuclear fusion and become a true star. The Moon would not be able to survive a direct collision. The Moon is also on Collision Course with Tora in Seance Spectre, a proto-planet condensing out of a smaller dust cloud, with electrical storms and rain in a carbon dioxide atmosphere. 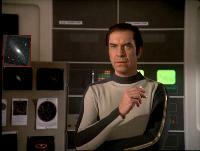 Space is a very stormy place in Space: 1999 . There are neutron storms mentioned in Dragon's Domain, proton storms in Death's Other Dominion and space storms in The Rules Of Luton (lasting forty-two days) and The Lambda Factor (or rather the absence of space storms is noted). Storms of ionised particles caused by solar flares are a risk outside the protection of the Earth's atmosphere and magnetic field, which can concentrate them in radiation belts. Neutrons are uncommon in solar radiation, and neutron storms are unheard of. In Mark Of Archanon we witness a "meteor storm", in which an Eagle rather unwisely flies through an intense bombardment of small asteroids. Meteor is a term usually given to a small asteroid (or "meteoroid") which is seen briefly as the friction of entering the atmosphere vaporises it (they are called "meteorites" if they reach the Earth's surface). The meteoroids may be a ring around some unseen planet, with complex gravitational and magnetic forces sorting them until the Eagle arrived; otherwise they would collide and disperse. Larger asteroids, metres or even kilometres wide, are also seen in the series. In Black Sun and Collision Course the Moon is on a collision course with asteroids. The Moonbase has meteorite screens to protect it from collisions with smaller meteorites, according to Another Time, Another Place, War Games, The Last Enemy and (seen failing to stop a meteorite that turns out to be a crushed Eagle) Space Brain. The asteroids seen in End Of Eternity and Seed Of Destruction are artificial. Asteroids seem to be debris left over from the formation of the solar system. From the cratering of the Moon and other planets in space they were numerous in the early solar system, but with some exceptions they are now confined to orbits between that of Mars and Jupiter, the "asteroid belt". The others have either collided with the planets and satellites, been captured as moons of some planets, or hurtled into space. In Dorzak Koenig is said to be "investigating a belt of asteroids which give some hope of colonisation". This is improbable on several counts, not least because even the largest asteroid, say 1000km across, is going to have barely a fraction of the mineral resources and gravity of the Moon. The Sun's asteroid belt is actually a huge area containing a few generally small and well scattered rocks. The end credits of Space: 1999 feature a comet travelling tail-first across the screen. Comets are lumps of dirty ice, a few kilometres in diameter, which may originate in a region around the solar system called the Oort cloud. When these icy masses fall into the inner solar system, the Sun melts the ice forming a gaseous cloud, or "coma", around the nucleus, and a tail of ionised particles is created by the solar wind; therefore the tail always points away from the sun, even if the comet is receding from it. Comets leave dust particles in their wake which on entering the Earth's atmosphere become meteor showers. The protostar in Catacombs Of The Moon seems to be the only star encountered at the start of its life. When nuclear fusion begins the star settles into a period of stability, the "main sequence". Some protostars with very little mass (less than 0.08 of the sun) cannot reach the critical temperatures to ignite fusion, and carry on contracting into brown dwarf stars, then black dwarfs. The Alphans briefly suspect the planet in Brian The Brain may be a black dwarf. Massive stars burn their hydrogen fuel rapidly, shine brightly and remain on the main sequence for short durations, perhaps only millions of years. Small stars shine more dimly and slowly, staying on the main sequence for many billions of years. Between the extremes, massive blue giant stars and tiny red dwarfs, is the sun, medium in size, brightness, and half way through a 20 billion year life span. In The Exiles the Moon is travelling between an area of close stars bathing them in a blue light. This suggests a close star cluster including several blue giants, shining with intense and lethal radiation. The parent star of the twin planets Betha and Delta in The Last Enemy may be a small, dim white dwarf, a star not much bigger than Earth. Planets may orbit very close to the star (1-2 million km), but the apparent size and temperature would be similar to the Sun from Earth. One side of the planet would be tidally locked towards its sun, the opposite side in permanent darkness. 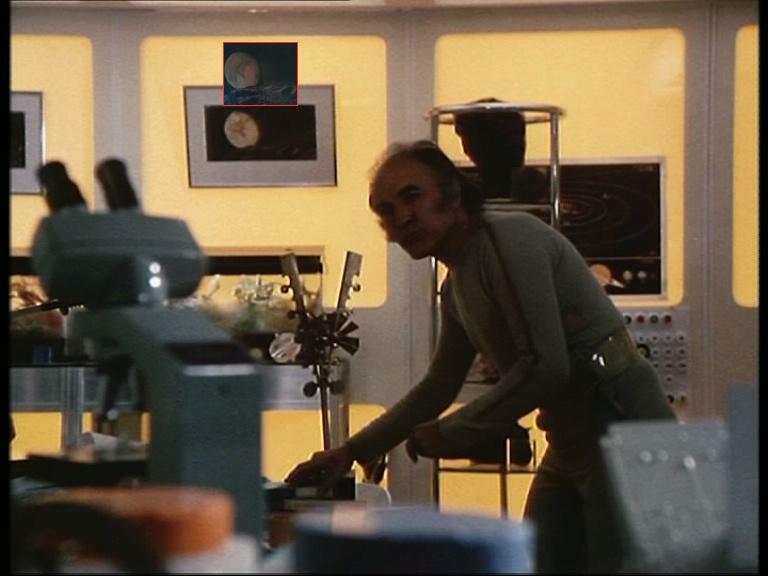 In Ring Around The Moon, Victor's noticeboard has an image of the Andromeda galaxy. The first supernova discovered outside our galaxy was S Andromedae, in the Andromeda galaxy, 2 million light years from Earth. Stars burn by fusing hydrogen into helium. The helium "ash" builds up in the core of the star until it reaches a critical level. At this point the helium core contracts, releasing energy to cause the star to burn more brightly and expand to become a red giant. The core continues to contract, and the surface of the star expands, until core temperatures are high enough to fuse the helium atoms into carbon. Meanwhile, the solar wind will be blowing away material from the surface of the star in very large quantities, and in the final stages much of the star's mass may be lost as a planetary nebula, a shell of gas ejected into space. The core of the star then contracts into a white dwarf, a dense ionic crystal lattice the size of the Earth. This seems to be the fate of Triton's sun, which according to Ring Around The Moon exploded, destroying the planets in its solar system. Supernovae have been observed several times. The first and most famous was by Chinese astronomers in 1054, when a star exploded and created the Crab Nebula. The planet Daria, as recounted in Mission Of The Darians, has also been destroyed, presumably by the death of its sun. The Kaldorians in Earthbound are fleeing sterility and death on their home planet, which may be induced by increased radiation from an aged sun beginning to swell into a red giant. In larger stars (6 to 8 the mass of the sun) carbon and higher atoms are fused in the core until it becomes iron. The loss of material may be much more violent and explosive, a supernova. The core then collapses into a neutron star, an object perhaps 20km in diameter and much more dense than a white dwarf, in which protons and electrons have been combined into neutrons. Neutron stars spin very fast and have massive magnetic fields, emitting radio or X rays in narrow beams like a lighthouse which can be detected as rapid flashes seconds (or fractions of a second) apart; these are pulsars. The most massive stars collapse beyond neutron stars, the core becoming a singularity, all the mass occupying zero area, infinitely dense. This is a black hole, so called because its gravity traps even light within an event horizon surrounding the singularity. The diameter of the event horizon is about 20-30km. Black holes also form at the centre of galaxies, becoming supermassive black holes with millions of solar masses. If they absorb enough material they can emit huge amounts of radiation as quasars, violently active but compact black holes in the nuclei of galaxies. In the episode Black Sun the Alphans encounter a black hole, although it is named as a Black Sun . Black Suns are also referred to in Dragon's Domain and Seed Of Destruction. Black holes were previously known by a variety of names, including frozen star and black star ; the term black hole was first coined by physicist John Wheeler in 1967, and popularised in Professor John Taylor's 1973 book Black Holes: The End of the Universe? (which may have inspired writer David Weir). Older theories proposed that black holes would swallow matter and eject it out of white holes elsewhere in the universe and at a different time. This has inspired many science fiction stories including this episode, although the science of white holes is now discounted. The depiction of a rim of stars around the event horizon caused by its gravity bending light was accurate, although Bergman dramatically underestimates it by claiming "a hat full of the stuff can weigh more than several Alphas" (this is true of a white dwarf; black holes can weigh more than several stars in a volume smaller than a pinhead). As objects approach the event horizon, the gravity force on the nearest side becomes much greater than the far side. These tidal forces will tear apart every object larger than a subatomic particle. We see an accurate depiction of the asteroid and the Eagle shredded by tidal forces, but the Moon is not affected. The event horizon seems much bigger than the Moon, suggesting a supermassive black hole as might occur in the centre of a galaxy. The gravity at the event horizon of supermassive black holes with more mass than a billion suns is not as intense, so tidal forces would not be significant. However, if Black Sun is such an object the asteroid and Eagle should not have been torn apart. A supermassive black hole would also not significantly slow time outside its event horizon; otherwise the escaping lifeboat Eagle could watch the Moon take millions of years to enter the black hole. Most stars rotate and therefore it is expected that most black holes in nature are rotating black holes. According to calculations by Roy Kerr and others, the singularity becomes a ring or doughnut-like torus rather than an infinitely small point. There are two event horizons, an inner and an outer; among other strange effects, time can reverse. Only objects that entered the event horizon on the plane of the equator would be destroyed in the singularity. According to one theory, matter entering from higher angles could be ejected into another universe; however, this is a very theoretical area. Outside the event horizon is an outer region, the ergosphere. Objects in this ergosphere are accelerated by the rotation of the black hole, but as they are outside the event horizon they may escape it, having gained energy (the Penrose process). Through a rotating black hole. Graphic and text thanks to Marcus Lindroos. A -- Mike Ryan's Eagle enters the equatorial region of the black hole, eventually hits the doughnut-shaped singularity inside and is immediately crushed into oblivion. 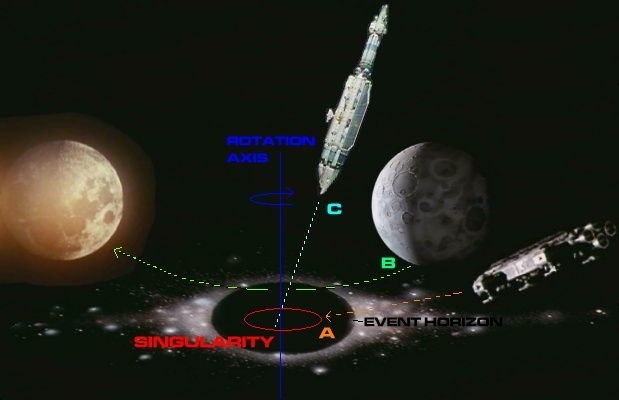 B -- Moonbase Alpha passes through the black hole from a higher angle and avoids the singularity altogether. It enters the event horizon and exits on the other side, but in doing so the Moon has also travelled forward or backward in time! Theoretical calculations indicate rotating black holes permit time travel, but there is one important limitation: it is always impossible to return to the place and time of origin. C -- Finally, a spaceship entering the polar region of the black hole and passing through the ring-shaped singularity without hitting it may also survive. But it probably enters an entirely different universe on the other side...perhaps a "negative universe" with antigravity. A nebula may collapse into several stars which soon disperse, although often two stars will be gravitationally linked in a binary system. One star in a binary pair may collapse into a white dwarf before the other; it will then drag matter from the other star onto its surface and explosively flare up, blasting the material away in what is called a nova. In The Taybor the planet Hermosia is named as orbiting a sun which went nova. It is very unlikely that a binary system, let alone one which included a white dwarf, would have planets, and they certainly would not have the stability for life to evolve. A more likely scenario is that the sun became a red giant. When stars do die, the planetary nebulae or supernova debris may trigger star formation, causing nearby nebulae to collapse and seeding them with heavier atoms such as carbon, silicon and iron. Therefore only these second generation stars can have rocky planets like the Earth, formed from the ash of exploded suns. Second generation stars are only found in the arms of spiral galaxies and in irregular galaxies, with clouds of gas and dust plus a wide distribution of different sized stars, including hot massive suns which live only a few million years. The nucleus of spiral galaxies, the compact globular clusters associated with galaxies, and elliptical galaxies have dense small red stars, unchanged for many billions of years, with little gas. As a consequence, there is little continuing star formation and probably no planets in the regions. The Alphans are lucky that their course has always been through spiral arms or irregular galaxies. Although they have crossed between galaxies, they have avoided the two-thirds of galaxies which are elliptical. The Alphans met one protoplanet, Tora in The Seance Spectre. Koenig claims they are 50 million years too early. In Earth terms, this is the Eocene period, when early humans were evolving on the plains of Africa. As it appears still to have parts of the nebulae from which it formed shielding it from view, it must be much older than that: 5 billion years is a better estimate. Mostly the Moon encountered Earth-type worlds orbiting stars "similar in size and characteristics to our own", as The Last Enemy puts it. Earth type planets need sun-like stars, with relatively long and stable lives. Large bright stars are too short lived, while small stars are too dim. Binary and variable stars are too unstable for life to develop. Within each solar system only those large rocky planets in orbits not too close and too hot, and not too far out and cold, will develop atmospheres like Earth and, possibly, evolve life. Again, the Moon was extremely fortunate to always pass such planets. The sun's solar system contains a variety of planets, including small rocky worlds such as Earth and large gaseous giants like Jupiter with many varied moons like small solar systems. In Another Time, Another Place the computer quickly discovers nine planets, a remarkable feat of observation, although according to Dragon's Domain there are in fact ten planets in Earth's solar system. In 2006, the number of planets was reduced from nine to eight, when Pluto was reclassified as a dwarf planet. Impressively, the voice probe in The A B Chrysalis recognises Earth from a drawing of one large circle (the Sun) and four similar sized ones (the inner solar system, which actually contains four very differently sized planets). Betha and Delta in The Last Enemy shared the same orbit, although always on opposite sides of their sun. Meta in Breakaway was a stray planet roaming through space, like the Moon. The solar wind of newly formed stars is very powerful, sweeping its solar system free of the original nebula material, and it could be capable of propelling orbiting planets into space as well. Giant planets like Jupiter can also distrupt the orbits of smaller planets, catapulting them from their solar system. Few planets had moons. The planet in The A B Chrysalis had six moons, although they may have been artificially re-positioned. Psychon had a moon according to The Bringers Of Wonder, although none had been seen in The Metamorph. Ellna and Entra in Devil's Planet were effectively a binary planet system, both with oxygen atmospheres, where life appears to have developed on the major planet Ellna and been transplanted to the "moon" Entra. The atmospheres of the rocky planets in Earth's solar system seem to originally have been ammonia and methane. This was gradually converted to carbon dioxide, plus nitrogen which gradually became fixed in rocks, and water. On a small world like Mars the water evaporated away, while on a hot world close to the sun like Venus the water was broken into oxygen, which reacted with the rocks, and hydrogen, which escaped. On Earth, however, life released nitrogen from the rocks and converted the carbon dioxide into oxygen, creating a nitrogen-oxygen atmosphere. The planet in The A B Chrysalis has a chlorine atmosphere and humanoid life. Chlorine is extremely reactive and thus seems improbable in an atmosphere, although the same could be said of oxygen. Apart from the subterranean humans the planet seems barren; perhaps some runaway chain reaction, or pollution, drove the atmosphere to such an extreme, killing surface life in the process. Ariel, seen in The Last Sunset, has four times the oxygen content of Earth. This is unstable (any fires would be impossible to put out) so perhaps they had the same serious problems. Ellna in Devil's Planet and the planet in All That Glisters have hydrogen in their atmospheres. Hydrogen is reactive in nitrogen and oxygen, or will quickly escape into space; it can occur in water so maybe atomic constituents were being quoted. Most Earth-type planets had blue skies: the blue colour is caused by the scattering of light by water molecules. The colour can be changed by pollutants, either man made or supplied by volcanoes or wind-swept deserts. Thus Terra Nova in Matter Of Life And Death, Piri in Guardian Of Piri, Delta in The Last Enemy and the planet in All That Glisters were red planets, while Zenno in Missing Link was purple. The Earth in Another Time, Another Place and Arkadia in The Testament Of Arkadia had pallid yellow skies. They all may have had extensive deserts providing dust to the atmosphere. The Moon was given an atmosphere in The Last Sunset. The highly improbable process involved many capsules on the surface pumping out billions of tonnes of compressed air, and was reversed at the end of the episode. The Moon's gravity is insufficient to retain an atmosphere, and even the huge mass of air they are given would dissipate but it would take thousands of years for the air to become unbreathable. There has been discussion of colliding an icy comet into the Moon; the water would create a breathable atmosphere (a process called terraforming). Planet D in Brian The Brain is "a small planet with no more gravity pull than we have"; therefore it should also lack an atmosphere, yet it has a dense toxic mist. Magus uses his almost magical powers to give another unbelievable atmosphere to New Earth, a quarter of the size of Earth, in New Adam, New Eve. Meta in Breakaway and Ultra in Dragon's Domain both have atmospheres. A nitrogen-oxygen or carbon dioxide atmosphere like Earth, Venus or Mars would freeze solid in the intense cold of the outer solar system. Earth-sized planets could accrete a thick atmosphere of hydrogen gas from the early solar system, before the gravity of giant planets ejects them into interstellar space. The dense hydrogen atmosphere would have a surface pressure similar to the bottom of Earth's oceans, but it would trap the geothermal heat. The surface temperature could be similar to Earth's, with water oceans, conditions that are suitable for life. Vega in One Moment Of Humanity had an atmosphere too thin to breathe, so presumably the humans and androids originally came from another planet. Ultima Thule in Death's Other Dominion was an ice-planet that had developed life. It may have been experiencing a very severe ice age much as the Earth has endured periodically. Causes could be long term variability of the sun, or of the planet orbit, or the drift of continents to a particular configuration, all of which can cause major climatic changes. These could also create the desert conditions for the planet in All That Glisters. Several planets suffered more violent effects. Psychon in The Metamorph had become a planet of volcanoes. Volcanoes occur in long lines where the plates of the planet crust are colliding, crushing up the continents into mountain ranges. As one plate is forced under another, the crustal material melts into magma and rises, erupting to the surface as a volcano. Volcanic activity also occurs at the spreading zones where the plates are formed and forced apart. These occur over hot spots in the planet mantle, where hotter mantle rocks are rising. To increase the volcanic activity, the mantle must have gained energy to form much more vigorous convection patterns, which seems improbable. Finally the planet blew up, as did New Earth in New Adam, New Eve. Two other planets abruptly disappeared: Sunim in A Matter of Balance and Atheria in Collision Course. Mystical forces and advanced technologies were at work, rather than physics. According to Breakaway, the Moon leaving Earth's orbit causes serious earthquakes around the world, as might be expected. Although they must exist, we were never shown the oceans of any planets, or any varied landscapes. Over the vast land surfaces of any planet, the Alphans always managed to land at just the right point to meet the aliens (in The A B Chrysalis the Eagle lands precisely on a narrow lift platform). They also assumed their findings were representative of the entire planet, rather than the specific conditions of a local area. There were good dramatic and budgetary reasons for not showing wide, comprehensive searches and multiple sampling points. While usually the viewer could presume such scientific procedures were happening off-screen, a few episodes gave the impression that the planets were completely uniform and unchanging. In A Matter of Balance the temperature of the planet is said to be "constant seventy-eight degrees" (i.e. 25 degrees centigrade); Earth's temperature can vary from -40 to +40. 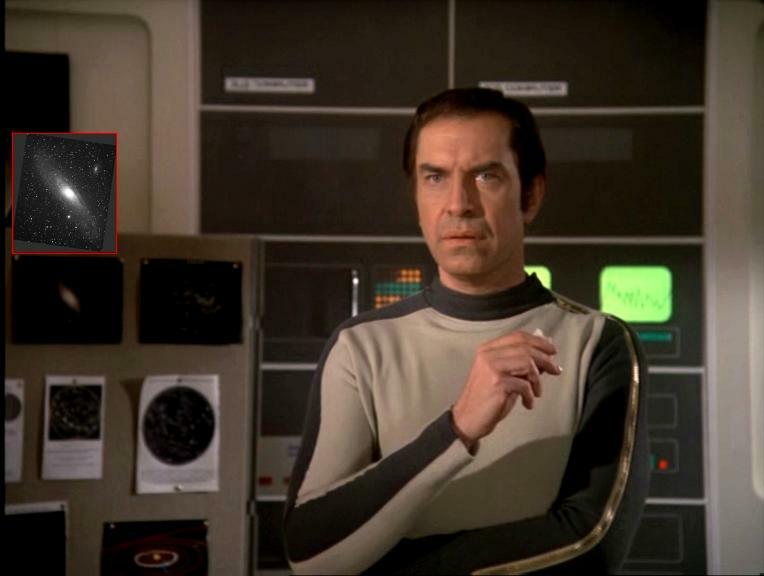 As the Moonbase was an international scientific establishment, it might be expected that the Alphans would use S.I. units and their derivatives. Instead the series reflected mid-1970s British and American confusions, with both metric and imperial units. Temperature was sometimes quoted as centigrade (Matter Of Life And Death, Collision Course, Mark Of Archanon, The Beta Cloud and Catacombs Of The Moon) and sometimes Fahrenheit (The Last Sunset, Death's Other Dominion, A Matter of Balance, Rules Of Luton, Journey To Where). A few episodes used metres (Ring Around The Moon, Alpha Child and The Last Sunset) but otherwise feet and miles were always used. In The A B Chrysalis Koenig asks Maya how she converts her "fractions of an ellipse" into "our system: miles per hour and feet per second". Apart from occasional colloquial use, the Alphans should be using degrees centigrade, metres and kilometres. Some units were given to absurd accuracy: in The A B Chrysalis Maya works out their arrival time to two decimal points of a second. Light years (the distance light travels in a year, equal to about 10 million million kilometres) were used as units of astronomical distance (in End Of Eternity, Dragon's Domain, The Metamorph, Space Warp and others). Some of the distances quoted were outside the galaxy: if Triton in Ring Around The Moon is two million light years from Earth it could be located in the Andromeda galaxy. Other planets in galaxies millions of light years away included Arkadia (a million light years, in The Testament Of Arkadia) and Zenno (5 million light years, in Missing Link). This would put the Moon into another galaxy (as Journey To Where and The Taybor state explicitly, see below). Parsecs (the distance at which an object would show a parallax of one second of arc, equal to about 3 light years) were used once (in Space Warp). Some measuring systems were invented. The lunar sky was divided into quadrants, for north, east and west (in Alpha Child, Rules Of Luton, Dorzak, Devil's Planet, The Beta Cloud and The Dorcons; the south quadrant never appeared). There was also a blue quadrant in Mark Of Archanon. Alternatively "orbital co-ordinates" were used, quoted as a three figure number usually beginning with 3 (War Games, Collision Course, Space Brain, Dragon's Domain and Mark Of Archanon). In Journey To Where an earthquake was rated "force beta zero" instead of the more familiar Richter or Mercalli scales. A few episodes were confused over astronomical terminology. In Ring Around The Moon Koenig is showing a sequence of pictures: "This is Triton's galaxy. This is Triton's star system. This is Triton's Universe. This is Triton's sun." The Universe is, by definition, everything: obviously a totally unrelated picture had crept into the sequence. In Space Brain Bergman comments "This is neither a sun, a star or a planet we're dealing with." A sun is a star. Black Sun, Dragon's Domain and Seed Of Destruction use the term Black Sun instead of "black hole". In Journey To Where a galaxy is about to eclipse the Alphans from Earth in a few hours. A galaxy is a vast system of millions of gravitationally linked stars. They are not particularly dense (particularly not to neutrinos, which can travel through several light years of lead without deflection) apart from the galactic core, which may contain a supermassive black hole. A sudden eclipse seems unlikely. The episode also uses the term "constellation" instead of galaxy: a constellation is an apparent configuration of a few stars against the sky, and is nothing like a galaxy. In The Taybor Koenig tries to describe the position of the Earth. He starts off badly, saying the Earth's galaxy is M104. It is in fact the Milky Way: M104 is the Sombrero Hat galaxy, 40 million light years away. Other information seems to come from New Concise Atlas Of The Universe by Patrick Moore (1974) (more). He says it is half way between PKS 114-800 and 3C454. Both these objects are quasars about 10 billion light years distant, and would be fairly good points from which to fix positions. He concludes: "It's a spiral galaxy, right near M33 and NGC 185, in a small cluster, 30 or so.." The Local Group of galaxies does include about 30 galaxies, dominated by two large spiral galaxies: the Andromeda galaxy, M31, with 300 billion solar masses, and the Milky Way, with 200 billion solar masses. The Triangulum galaxy, M33, with 30 billion solar masses, is the third largest, 3 million light years from us, situated close to Andromeda. Maffei I is the fourth largest, and the remainder are irregular and dwarf elliptical galaxies associated with the four major galaxies. NGC 185 is a dwarf elliptical galaxy associated with Andromeda (2.3 million light years away). In a diagram in Patrick Moore's atlas, M33 and NGC 185 do appear close to the Milky Way, although later research will have changed the diagram (M33 nows seems to be slightly more distant than Andromeda, M31, and both M33 and NGC 185 are now generally regarded as satellite galaxies of Andromeda, not the Milky Way). Some lunar facts were confused. In Journey To Where, the crater Copernicus was called a mountain. It is correctly located below the Mare Imbrium however. In Space Warp Maya is located in "area Copernicus of the Copernicus depression". Caves under the Moonbase are seen in The Mark Of Archanon and Catacombs Of The Moon. It is not stated whether they are natural or artificially excavated, although the former is extremely unlikely (caves are formed primarily by underground streams and rivers dissolving and eroding rock: there is no water on the moon).